Many of us use the iPhone as our primary alarm clocks, but if you’re a heavy sleeper then the volume of the alarm may not be sufficient to pull you out of a deep slumber, and you can easily dismiss the alarm in a half-awake state which doesn’t help much either. The first and most obvious solution is to make sure you crank the general iPhone volume up all the way before passing out for the night. But since the general ringer volume and alarm clock volume are one and the same on the iPhone, you can’t have one all the way up without the other up too, so it’s best to do that with a combination of Do Not Disturb to avoid loud calls and alerts in off hours. So, what to do? Well, there are a few other options to make the alarm sound louder, and until Apple separates the Clock Alarm app volume from the general iOS system volume (if they ever do), you may want to try these volume booster tricks out, which range from completely legitimate to a little on the goofy side. The actual ringtone / sound effect of the alarm sound can make a big difference in how loud it plays. Alarm sound tones like “Ripples”, “Silk”, and “Slow Rise” may be nice and peaceful, but they’re not necessarily loud or obnoxious enough to pull you out of bed. Thus, aiming for a sound effect that is both very loud and annoying is actually a great strategy. The classic sound “Alarm” fits the bill perfectly, it sounds like some sort of volcano nuclear tsunami alert system that is all but guaranteed to pull you out of the deepest of REM sleep. Or pick a song for the alarm that is particularly loud, that works great too. 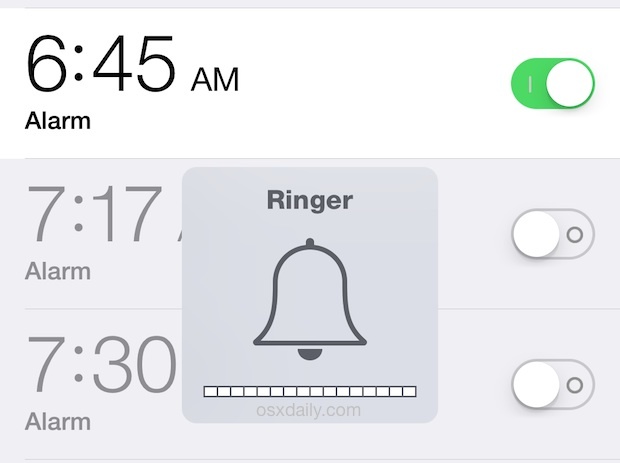 Change your iPhone Alarm sound effect in Clock app > Alarm > Edit > Sound. Whether a set of Bluetooth speakers , an iPhone speaker dock, or simply plugging the iPhone in through an AUX cable, external speakers can blast your alarm throughout the neighborhood. If you’re an extra deep sleeper, you probably won’t find a better solution than this, and you can still use one of the more pleasant sounding alarm sound effects since the speaker volume can be so loud that even “Silk” is no longer pleasant. Having a decent set of Bluetooth speakers is nice outside of the alarm situation anyway. A good iPhone Dock is also a very reasonable option, since it can charge your iPhone too. If you’re in a bind you can always try the container amplification trick, or the toilet paper roll trick. Say what? Ok so the amplification container works like this; get a glass or plastic bin and place your iPhone in it, then tilt the open face of the container to your bed. Something like a deep cereal bowl or large coffee cup works too (just make sure it’s empty). 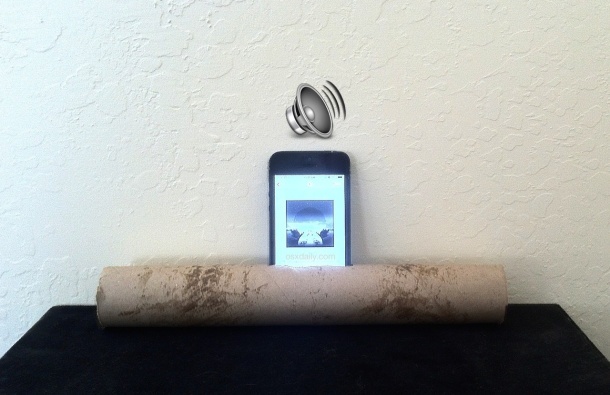 As for the incredibly stupid iPhone toilet paper roll or paper towel roll trick shown above? Yea it works for cranking out a louder more dreadful sounding alarm too, but it looks like… well… you know, not necessarily the most classy bedside item you could have. Do you have a solution to making your iPhone alarm Clock app sound to play at a louder volume? Maybe ditching the default app and using a third party clock? Let us know in the comments. I can’t believe he missed the most obvious tip. Hold the phone to your ear and using duct tape, place a few wraps around your face, to hold the phone to your ear over night. Don’t forget to set the alarm first! LOL, you joke but I have a friend who sleeps with earbuds in, so not too different once the alarm clock goes off, really! Don’t forget to have your phone turned on. Oh look it’s Tim complaining again, this time about his iPhone not being turned on so he slept through the alarm. You guys only write OSXDaily.com for Tim, right? For years now, I’ve used the obvious sound “Alarm” (in classic) when editing your sound for the alarm clock option. Seems to be the loudest. As for calls waking you up in the dead of night… you can flip the silence switch and silence all of your calls, but your alarms will go off as scheduled! Do you have a similar one to increase the volume of voicemail without using the loudspeaker? Ever since the latest update I can’t hear my voicemail without turning on the loudspeaker, which means everyone else nearby can hear my voicemail. I’ve called both AppleCare and my cell phone provider, but neither one has been able to fix it. I use me trusty Android for alarms. Lollipop ( 5.01) has the cool Interrupt feature letting me adjust volumes / apps separately. Try it u may like it. Your welcome. Yaa , one time however I did sleep in …. I was up late reading all the technical posts from OSX Daily. Stuff like how to change wallpaper , turning off iPhone and how to hold it in your hand. Im overwhelmed. LoL. For your alarm just use a song rather than a small sound effect. The tune will play until you shut it off. Just pick something that lasts a few minutes and that has a serious wake up introduction. My guess is that if a lot of people quit drinking and using drugs they wouldn’t sleep so “soundly”. Not exactly, some people are just very sound sleepers. Your body awakes before your brain. “Dem Bones” by Alice in Chains. The lead-in is guaranteed to wake the dead. I make my own tones and edit them to yield the maximum volume, filtering from 200hz down to give more headroom. I have tones that would wake the dead!!!! Anyone can do this in Garageband or any audio editing program. Once done, in iTunes, create an AAC version, then drag it to the desktop. get info, and change the extension from m4a to m4r. drop this into itunes, and it automatically is filed as a ringtone, which you can sync to any iDevice. Just make sure it’s less than 20 seconds long. Before you export the AAC file, get info and crank up the volume to +100% for even more waking ear catching volume!!!! You can also set an eq in iTunes for a more midrange tone that will rattle the sheets!!!! Buy a cheap alarm clock. Problem solved! I had the problem of turning off the alarm w/o being fully awake till I moved the phone. I removed it from my bedside table to my dresser. I had to walk a few steps to the phone. This solved my problem. I awoke fully for the alarm as well as important calls. My1st iPhone after Blackberries and a couple Androids. $700 phone on the 8th OS and we need to do this stupid dance for a basic function is nuts. Fanboy defenders of the lame. And for those of us who listen to music to fall asleep, but don’t want it all the way up….argh. C’mon Apple, this really should have already come to you guys. I’m with Icebear. I need the alarm sound to broadcast through a bluetooth speaker and it doesn’t. Am I missing something? I think there are docking stations (e.g. Sony, iHome, Philips) with Radio and Alarms programmable over Apps provider from the manufacturer. Some even provide Bluetooth so the device doesn’t need to be in docking station. I haven’t tested any of it my own. Actually I’m wondering if some one of you knows if with any od these products also iOS calendar Reminders could be played or even better for me would be if the iOS calendar event could be synced to the external alarm clock — I wouldn’t even need the radio function or a high sound quality. But it should be portable, AC power connection PLUS battery back up, so the Alarm would go off trough the external alarm clock even with AC power loss or when travelling and no AC power available. Apple spent all the R&D money on Siri so that she can tell you “Good question” everytime you ask something. Apple should have saved a few dollars to put a volume adjustment on the clock. This is the first phone Ive had the doesnt allow you to adjust the alarm clock. Just another reason why I shouldn’t have switched from Android. Iphone cant even perform the simplest task. Even the copy/paste function has issue from time to time. Dumbphone not a smartphone. Better late than never folks! Hope some of you are still around. If you put an ordinary alarm clock on a plate it make the alarm sound louder! Don’t know if that applies to iphones,will try and then post result. When my sons were living at home I would take the dog into their bed room and throw a large dog biscuit into the bed. Woke them up!